VOSIS is presented as part of our Guest Curator Exhibition - SV+VS (Sonifying Visuals / Visualizing Sound) curated by Yoon C Han. VOSIS is an interactive image sonication interface that creates complex wavetables by raster scanning greyscale image pixel data. 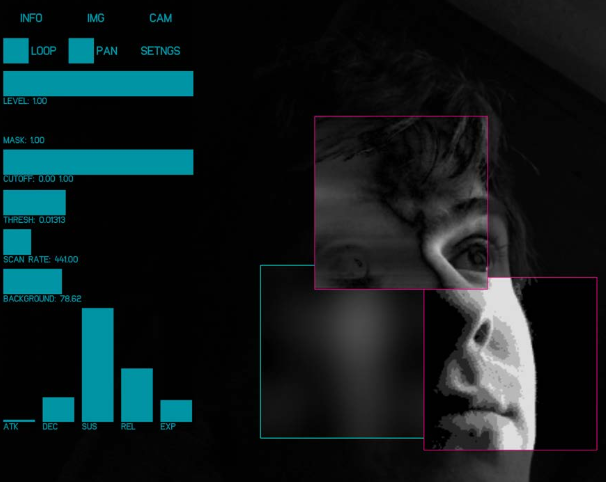 Using a multi-touch screen to play image regions of unique frequency content rather than a linear scale of frequencies, it becomes a unique performance tool for experimental and visual music. A number of image filters controlled by multi-touch gestures add variation to the sound palette. On a mobile device, parameters controlled by the accelerometer add another layer expressivity to the resulting audio-visual montages.